If i could give more stars i would.i will start by the owners. They are both absolutely adorable. They have done everything to make our holidays perfect.we had a fridge full of wine, beverage, cheese, fruits. Therese also cooked a beautiful meal for us and many salads. A good welcome for our first day.we then toasted together with a bottle of wine to the beginning of our stay. The house is first class and very clean with spectacular gardens all around. The heated swimming pool is amazing to a perfect temperature to swimm day and night. Everything is very well maintained .all you need is there . Air conditioning is very good all around the house. The location of the property is fantastic. 20 mn walk to st paul de vence village with amazing art galleries. Supermarket is only 10mn by car and is big enough for provisions. Merci pour tous ces compliments que je sais sincères de votre part. Vos vacances à Carpe Diem a été pour toute la famille une expérience magnifique et pour nous, c'est le plus beau cadeau que vous puissiez nous faire. Vous connaître c'est avoir envie de prolonger ces moments de partage comme avec des amis de longue date. Quelle belle rencontre! Je vous embrasse chaleureusement avec l'espoir de vous accueillir une nouvelle fois. Our family of seven adults enjoyed a wonderful week in this delightful villa! The bedroom and bathroom layouts are a perfect arrangement for anyone. We arrived to a sparkling clean house and the pool was just the right size to swim in. 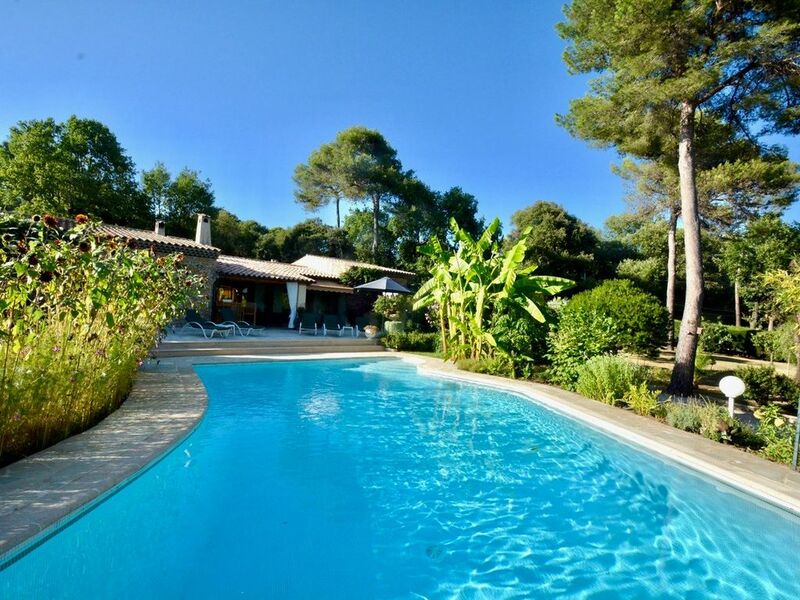 The house is only a 20 minute walk to the beautiful town of Saint Paul de Vence. Excellent grocery stores are a short drive away and the geographical area around this location is simply beautiful. Our hosts, Therese and Jean-Claude were gracious, responsive and very friendly. They are people that I would truly love to take to dinner! Quel plaisir d'avoir accueilli cette grande famille! Avant leur arrivée, j'avais déjà ressenti à travers nos nombreux échanges par mail, une véritable joie de la part de Merrie de réunir à la maison pour une semaine, ses enfants venus de cinq états différents des Etats-Unis. J'ai également apprécié leur contact chaleureux, leur simplicité, leur spontanéité et le respect total de notre maison comme s'il s'agissait de la leur. Les revoir tous et les connaître davantage serait un bonheur...Maybe the next year? Nous gardons de leur passage un souvenir excellent, c'est sûr! We had a very nice week, at a fantastic house. The pictures does not describe it good enough, its a lot nicer then that. Short walking distance to st paul, but house is in a quiet neighboorhood. When we arrived they had made a delecious homemade dinner for us, delightful! We will come back! The house is better than in the pictures and the owners are charming and wonderful people. I could go on and on but the most important message is that this is a house I would come back to time and time again. Avec retard, je réponds à votre appréciation si touchante! Un grand merci ! Nous vous avons vraiment appréciés...Vous revoir n'est pas un vain mot mais une joie partagée! What a lovely villa with even more lovely owners, Therese made us feel very welcome and was a great help. The villa is fantastic and has everything you need (except for Petanque rules but you can get them off the internet). The outdoor area is really lovely and we could have spent out whole week out there. We would recommend this to anyone, you 'll have great time. Merci pour votre appréciation reconnaissante. Peut-être aurons-nous la joie de vous revoir? We arrived from Nice airport Mrs Massa had a beautiful meal waiting for us and a glass of wine to toast the start of our holiday. This beautiful villa was exactly as described on the website, spotless and very well maintained. After showing us around the villa and running through all the facilities Mr and Mrs Massa left us to start our holiday and what a place to holiday, the gardens were full of beautiful flowers the terrace and barbeque area were a delightful place to sit and chat and eat morning or evening. Bedrooms with ensuite bathrooms again spotless and clean with air conditioning the whole villa was just a joy to stay in. St Paul de Vence was a healthy walk away or 6 minutes by car with spectacular views and nice restaurants, Vence about 10 minutes away by car a nice place to get your provisions at the supermarket or the shops in the old village part of the town. If you like shopping the recently opened Polygone shopping centre in Cagnes Sur Mer is certainly worth a visit about 30 minutes away from the Villa. Avec grand plaisir nous avons fait connaissance de 8 Anglais vraiment agréables, intéressants, délicats et reconnaissants des petits "plus" offerts en toute sympathie. Bien sûr, les revoir l'année prochaine serait une joie !